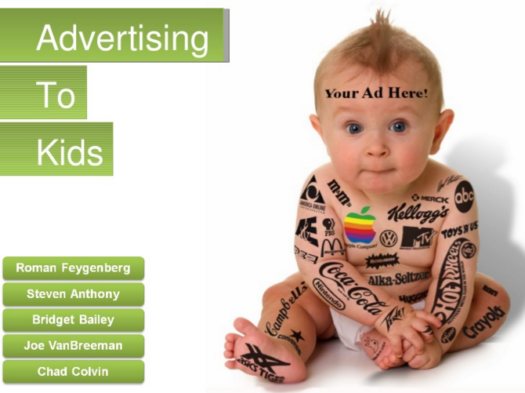 Everyone knows the saying “Monkey see, monkey do.” That saying is talking about children and do we really want our children to copy or want what advertisements show. The way that advertisements sell things to kids is just wrong. They know that if the children like what they are selling they will beg until they get what they want. Marketers know this too and that is why they target children for their ads. Advertisements are just here for marketers to make money. When the ad says, “You NEED this” or “this will make life easier,” or ” this is so fun!” Just remember they are saying these things just to get money from you. Children love watching television and there is nothing terribly wrong with that but when commercials come on that is when the bad comes out. Everything the children see they want. They think just because they do not have it then they are not normal or cool like the rest of the kids. Most young children do not even know how much they learn from advertisements and are quite sensitive to external influences. Most of the time they do not know how to act because they are so excited about this cool new thing. Kids should not be brainwashed by all of these ads because they are never truly good for the kids. The kids mock all of what they see from shows or real life so you do not want them to mock ads as well. “Advertisements need to promote something actually important to benefit the future and educate the kids not just for toys and clothes,” said junior, Isabella Nanni. Kids should not have to listen to these ads to know what is cool or how to act cool because every kid is unique in their own way.